One of the newest weapons in the Air Force's arsenal of hard target penetrating bombs is the AFRL Munitions Directorate-developed Advanced Unitary Penetrator (AUP) shrouded aerial bomb, equipped with the Hard Target Smart Fuze (HTSF). The bomb and its smart fuze were a big hit during Operation Allied Force. The AUP mimics, in appearance and dimensions, the already combat-proven BLU-109 (Bomb Live Unit) warhead, a 2,000-pound hard target penetrating warhead used by the Air Force and Navy. The AUP is designated the BLU-116 and boasts twice the penetration capability of the BLU-109. The Advanced Unitary Penetrator (AUP) is the next-generation, hard target penetrator munition that provides a lethal capability to penetrate and defeat extremely hard multilayer underground facilities. Sharing an external appearance and flight characteristics with the 2000 lb BLU-109, the AUP has an advanced heavy steel penetrator warhead filled with high-energy explosives that can penetrate more than twice as much reinforced concrete as the BLU-109. Performance is enhanced by a void-sensing Hard Target Smart Fuze that detonates the AUP at the optimum point in a target to inflict maximum damage. A bomb typically includes a hard casing having an interior hollow space for containing an explosive material. The physical characteristics of the bomb, including the weight, center of gravity, moments or inertia, and the aerodynamic shape, all affect the free-fall response of the bomb, whether or not a guidance package is included with the bomb. Bombs delivered from aircraft, including free-fall guided or unguided bombs, glide bombs, and boosted bombs, must pass rigorous field testing which includes the safe release from a deploying aircraft and accuracy of delivery to the target. These tests must be conducted for each type of aircraft that will carry the bomb. The development of new weapons, therefore, is subject to significant delay and expense before the weapon is qualified for use. The ability of a bomb, or other projectile, to penetrate a target is proportional to the mass and the velocity of impact of the projectile and inversely proportional to the cross-sectional area of the bomb. That is, the greater the kinetic energy and the smaller the cross-sectional area, the greater the penetration that can be expected. To adapt an existing bomb for greater penetration by reducing the external diameter of the bomb can also result, however, in changes in the mass properties such as weight, center of gravity, moment of inertia, and in the aerodynamic properties, all of which can affect the flight characteristics of the bomb. These changes also require that the adapted bomb be qualified for use. The Advanced Unitary Penetrator hard target penetrator, designated the GBU-24 C/B (USAF) and GBU-24 D/B (Navy), features an elongated narrow diameter case made of a tough nickel-cobalt steel alloy called 9430M. During July 1996 rocket-sled tests by the Air Force's Wright Laboratory Armaments Directorate the AUP successfully penetrated 11 feet of reinforced concrete, equivalent to over 100 feet of soil. It achieves its performance by increasing the area density (warhead weight divided by cross-sectional area) of the weapon. The AUP objective is twice the penetration capability of the BLU-109 class in order to provide a more reliable kill for hard buried targets containing WMD facilities. The penetrator warhead is subcalibered in an aluminum shroud to duplicate the external dimensions, mass properties, and aerodynamics of standard BLU-109 warheads already in the U.S. Air Force, U.S. Navy, and international munitions inventories. During target penetration, the shroud tears away from the penetrator body to maximize target penetration and terradynamic stability. The BLU-116 AUP is shaped to emulate the BLU-109/B bomb, that is, the outer shape of the shroud 40 is substantially identical to the outer shape of the hard case of the BLU-109/B. In addition, the weight, center of gravity, and moments of inertia of the bomb are substantially identical to those physical characteristics of the BLU-109/B. The BLU-116 AUP will therefore have the same free-fall and aerodynamic properties as the emulated bomb, and as a result can be carried on any aircraft for which the emulated bomb is qualified. Further, the BLU-116 AUP can be used with any guidance package appropriate for the emulated bomb. The improved BLU-116 AUP, however, avoids the lengthy and costly flight qualification tests because it is qualified by similarity to the qualified bomb. The invention thus provides an aerial bomb that improves on the function of an existing bomb, but qualifies for use by emulating the handling and aerial delivery characteristics of the existing bomb. 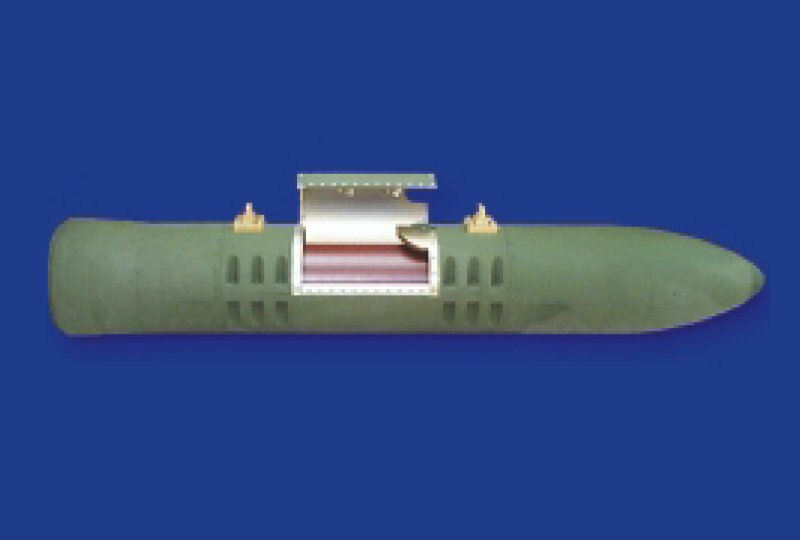 Similar in size and shape to the BLU-109, the AUP warhead consists of a steel case penetrator filled with high explosive and enclosed by an aluminum shroud. The warhead is fitted with standard-spaced NATO 30-inch suspension lugs. The AUP can make use of the BLU-109 proven family of guidance kits for precision delivery, including the GBU-10, GBU-15, GBU-24, GBU-27, JDAM, and AGM-130 kits. The shroud also replicates BLU-109 surfaces for attachment of hardbacks, air foil groups, guidance systems, propulsion units, and ground handling equipment. The penetrating body has a weight (loaded with an explosive charge) that is between 80% and 90% of the weight of the BLU-109/B. The reduced diameter with approximately the same weight increases the penetration ability of the penetrating body as compared to the BLU-109/B by focusing kinetic energy on a smaller impact area. The penetrating body is shaped at the nose end with an ogive having a variable radius of curvature. The nose end outer shape leads to a cylindrical center portion. The outer diameter of the penetrating body, measured at the cylindrical center portion is 10.7 inches, as compared to an outer diameter of the BLU-109/B of 14.6 inches at a center portion. The thickness of the wall of the penetrating body surrounding the bore is 2.26 inches. Air Force Research Laboratory Munitions Directorate engineers have completed development of the new warhead known as the Advanced Unitary Penetrator. The warhead was successfully transitioned to the Precision Strike System Program Office at Eglin AFB, FL for Engineering Manufacturing Development (EMD) and production. The AUP was developed in less than three years at a cost of less than $8M. AFRL's emphasis on operational suitability as part of AUP weapon design will allow the EMD program to be completed in less than half the time of a normal EMD program. The Advanced Unitary Penetrator [AUP] hard target penetrator features an elongated narrow diameter case made of a tough nickel-cobalt steel alloy called Air Force 1410. With the official designation of BLU-116, and designated the GBU-24 C/B (USAF) and GBU-24 D/B (Navy), is designed to provide at least twice the penetration capability of existing BLU-109 2000-pound bombs. The AUP is being demonstrated with Boeing as prime and Lockheed-Martin as subcontractor. Penetration capability is directly proportional to the warhead's sectional density--its weight divided by its cross section. The AUP maximizes sectional density by reducing the explosive payload and using heavy metals in the warhead case. Lower explosive payload will diminish dispersion of NBC agents to help reduce collateral effects. The AUP will retain the carriage and flight characteristics of the BLU-109, and it will be compatible with the GBU-24, GBU-27, and GBU-15/AGM-130 series of precision-guided bombs. Thus, the AUP will be capable of delivery from a wider inventory of aircraft, including stealth platforms, than the BLU-113/GBU-28. A proposal to replace the current CALCM warhead with an AUP warhead provides 2.5 times BLU-109 penetration capability. The AUP development effort was conducted in support of the Counterproliferation Initiative (CPI) Advanced Concept Technology Demonstration (ACTD). The program objective was to develop and demonstrate a weapon that could be rapidly transitioned for Air Force and Navy use against hardened targets associated with the production, storage, and weaponization of chemical or biological agents. Normally, the introduction of a new weapon is a very long, expensive, and tedious process - as long as ten years or more. The associated cost may be tens of millions of dollars. The 1,700-pound AUP warhead is tucked inside a lightweight aerodynamic shroud. This "outer skin" gives the AUP the exact physical and aerodynamic characteristics of the BLU-109. The shroud strips away from the internal penetrator when the weapon impacts the target. Compared to the BLU-109, the AUP has thicker case walls, a tougher case material, an improved nose shape, and a smaller explosive charge. The cross-sectional area of the AUP penetrator, however, is only half as great as the cross-sectional area of the BLU-109. A smaller explosive charge reduces collateral damage potential by reducing blast overpressure that could expel chemical or biological agents from the target. A long testing series demonstrated AUP's compatibility with the Munitions Directorate-developed Hard Target Smart Fuze (HTSF). The HTSF allows the AUP to be detonated at the optimal point within a target to inflict maximum damage. That ability compensates for the reduction in explosive charge. Because it's a "twin" to the BLU-109, the AUP can utilize a proven system of hardbacks, guidance units, and tail fin kits. The costs associated with developing new kits is eliminated. The operational users - pilots, weapon handlers and load crews - will gain the improved war fighting capabilities of the AUP without the costs associated with retraining support personnel or the acquisition of new delivery systems and support equipment. Battle commanders will also have increased ability to neutralize deeply buried hardened targets. During Operation ALLIED FORCE, Naval Air Warfare Center Weapons Division [NAWCWD] at China Lake supported the Fleet in the quick reaction deployment of the residual GBU-24D/B assets (9 BLU-116 warheads and 22 FMU-157 fuzes). Support included assisting in deployment coordination of the Fallon "tiger" team, providing documentation (maintenance, loading, and assembly procedures), over-night transporting of equipment to Fallon, and providing data in support of expediting the flight clearance, WSESRB, and IM approvals. "You can run, but why die tired?" That`s the advice some ammo troops at Aviano Air Base, Italy, gave to Yugoslavian forces when writing messages on the bombs they built. National Forge Company became the program manager for contracts awarded by China Lake (NAWCWD) in 2000, 2001 and 2002 for the production of, respectively, 31 (Ref# N68936-00-C-0180), 3 (Ref# N68936-01-P-0750), and 148 (Ref# N68936-02-C-0031) BLU-116 assemblies.